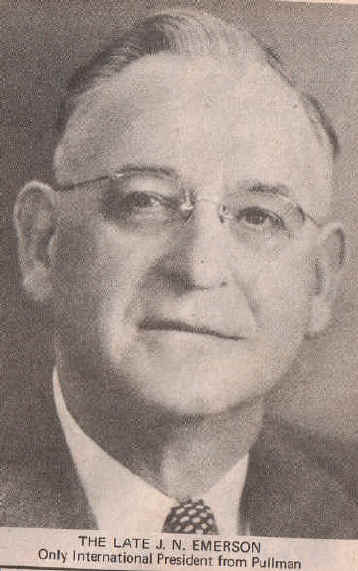 In 1931-1932, J. N. Emerson served as the President of the Kiwanis Club of Pullman, Washington. See all of the club presidents. In 1933-1934, J. N. Emerson served as the first Lieutenant Governor from the Kiwanis Club of Pullman. See all of the lieutenant governors from the Pullman club. In the midst of the Great Depression, in 1936, the Kiwanis Club of Pullman established the Circle K House for students at Washington State College, now Washington State University. The proposal for the Circle K House came from J. N. Emerson. The club embraced the idea and put it into action. This was a precursor to today’s Circle K Clubs on college and university campuses, including one at WSU in Pullman. In 1947, J.N. Emerson became one of the most dynamic Kiwanis International Presidents, the first and only International President from the Pullman Club. Born on November 24, 1879, in Ohio, Jay Noble Emerson and his wife Amelia moved to Pullman in 1910. His business was the Emerson Mercantile Company.